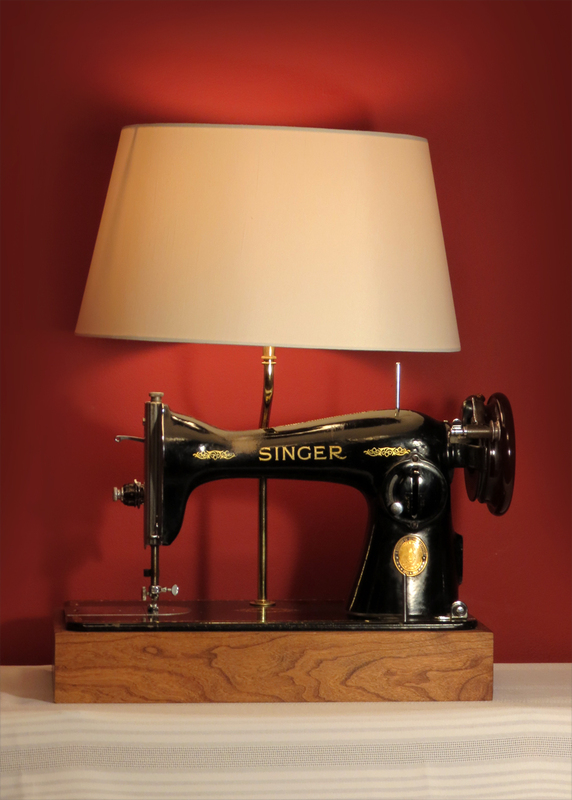 This is a classic vintage Singer sewing machine, made around 1950 for the 100th anniversary of the SInger Sewing Machine Co in 1951. This machine is in pretty good shape, although it does have a bit of wear on it where there was a pin cushion attached. It was originally installed in a flip-top table, however, we’ve made a walnut base for it so it would sit on the table better. A figurine lamp pipe and a plain off-white shade focusses the light down onto the nicely decorated machie. All electrical components are new. Comes with a standard base socket and approximately 6′ of clear vinyl cord. Bulb is not included.